Mountain tops, summits, defiles and valley bottoms cannot be claimed. Candidates as well as existing members of the Club des Cent Cols do not have to supply any proof of having climbed the passes. The Club respects the good faith and honesty underlying the lists of passes declared. The Club des Cent Cols does not recognise artificially-created passes – i.e. those that have been named purely to inflate the number of potential passes, given that their names have not been established through their use in the region and do not appear on any prior document. Each year, in the summer, an international meeting is organised at the summit of a pass that the Club wishes to make better known to its members. Each year, between October 1st and January 31st, members should send the list of new passes climbed during the year to their Territorial or National Delegate together with their membership fee. The fee of €12 (subject to change) will allow an existing member to appear in the Honour Roll of the Club in the yearly magazine and to participate actively in the life of the Club. As an exception to the general rule, the ratio of 5 passes at +2000 m for each one hundred is not applied to members who are 70 years old or more. These lists are verified by the Club Secretary supported by the Delegates in order to check that the passes claimed are in accordance with the Rules of the Game. The address of the Club Secretariat and those of the National and Territorial Delegates can be found at the beginning of the annual magazine as well as on the Club’s Internet site. “Cycled” means using a bicycle – in other words any such human-powered machine propelled purely through muscle strength. This is normally a two-wheeled machine but tricycles are also allowed. Reaching the summit in a ski-lift is not allowed. It is acceptable to count a pass that is crossed during the descent. Both off-road passes and road passes are allowed. Passes in difficult terrain can be climbed by pushing (or even carrying) the bicycle. One hundred different passes : the same pass can only be counted once even if it has been climbed several times and from different sides. Passes can be climbed in every country in the world. The Honour Roll in the yearly magazine summarises for each member the total number of passes achieved as well as those of 2000 m and more. Some passes may be crossed by two different passages – one being the geographic pass and the other a tunnel. These constitute the same pass – climbable by two different passages. Each passage has a different code but it is only allowed to declare one of them – either the geographic passage, or the tunnel, but not both. In French the expression “col” includes implicitly a topographic character. Taking into account the many possible types of terrain that can be encountered the minimum definition of a pass’s topographic character that the Club has adopted is the following : a favoured passage, dictated by the relief, situated on a watershed and excluding summits. Many “descriptors” (synonyms for “col”) are used instead of the word col : collet, pas , port, baisse, selle, brèche, hourquette, etc. The Catalogue of Cols in France lists those descriptors that can be used to designate a pass. Likewise the catalogues of passes for other countries or other regions establish a list of local toponyms that can designate a pass. A descriptor does not necessarily designate a pass in all cases – e.g. a “collet” in France, a “colle” in Italy, an “alto” in Spain, a “Höhe” in Germany/Austria, an “Egg” or an “Eck(e) in Switzerland can designate a summit or a ridge instead of a pass. Similarly a British or German “pas” or “pass” can designate a gorge or a river passage. In such cases they are not included in the catalogues because they do not fulfill the topographic requirements (see the well-known example of the Pas de la Case on the Andorran border). “Pass named as such” : a pass must be named in a reference source by a generic descriptor as explained above, together with the specific name. Examples : Col du Tourmalet, Col de la Croix de Fer, Puerto de la Bonaigua, Passo dello Stelvio, Sustenpass, etc. It can happen that a pass’s name is only made up of the descriptor . Examples : Le Collet (FR-04-0738) or Le Col (FR-26-0410). On the other hand a place-name with no descriptor evoking the concept of a pass will not be retained, even if the topographic criteria are acceptable. Examples : “La Baraque” or “La Chapelle”. Likewise a topographic pass, indicated on the map by a symbol )( but with no generic name (descriptor) nor synonym will not be retained. A place-name shown on the Land Registry, whether this applies to a specific point or a sheet of the Registry, with a descriptor evoking a pass, is valid under the Rules of the Game providing that it is possible to identify in the neighbourhood a place corresponding to the afore–mentioned definition (a favoured passage, dictated by the relief, situated on a watershed and excluding summits). A good knowledge of the practices and usages of people in the region can help both to locate and recognise the pass. Guides published by Mountaineering Clubs that are recognised for their competence and detailed knowledge of the terrain : Club Alpin Français, Club Alpino Italiano, Club Vosgien etc. Passes named only according to oral traditions or mentioned in a tourist guide are considered only to provide a first clue which could lead us to carry out additional research in order to establish their usage on one of the sources listed above. We do not recognise as an adequate source the route-maps or leaflets for cycle races and touring events. Names such as “Col du Mont Ventoux” or “Col de l’Alpe d’Huez” that one can find on such documents do not transform this summit or ski station respectively into passes as defined in our Rules of the Game. It should be pointed out that it is not required to provide a photo taken in front of the summit signpost. The declaration of passes that have been climbed is done on an honour basis. However photos of passes, the countryside and stories of treks in the mountains or meeting other cyclists are always appreciated as content for the annual magazine. The Club des Cent cols reserves the right to not recognise passes shown on signposts or maps if they have been created by local officials with the sole purpose of increasing the number of passes in our catalogues. On the other hand seeking out pass-names that can be found in local usage and traditions and that may be recognised on valid documents is greatly encouraged. This summer meeting, with an international flavour, is organised by the Club which proposes to its members to meet together during a stay with the aim of discovering the passes in one particular area. Other regional meetings are proposed by the regional animators. It is also quite possible for members of the Club to organise purely local events. The timetable, the meeting-places and the condensed programme of such meetings are published in the annual magazine. This agreement or commitment entails submitting pass-lists in accordance with the reference catalogues and the definition of passes recognised by the Club. Sending the list to the Secretariat or the Delegates is a good opportunity to highlight new passes that have been discovered that may subsequently enhance the catalogues. 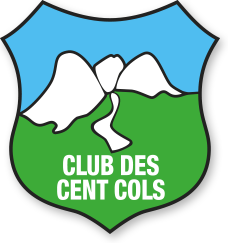 The Club des Cent Cols is an Association set up under the “1901 Law” managed by a Governing Body (CA) of 8 members, elected for a period of 4 years by all members who are up-to-date with their subscriptions. The Club is affiliated with the French Cyclotouring Federation (FFCT) as club N° 6384 and is therefore accredited to provide a (French) Federal Licence including insurance for those members requesting this facility. The Club calls upon a network of Territorial and National Delegates to support the Secretariat in receiving and validating the members’ annual pass-lists. In the yearly magazine the “Honour Roll” summarises for each member the amount of the subscription that has been paid, the total cumulative number of passes climbed as well as the number of passes of 2000m or more. Workgroups (GT), set up in agreement with the CA, are made up of volunteers with good linguistic knowledge and access to local and detailed maps of the relevant region or country. Their role consists of establishing proposals for catalogues for each country (or region) as well as updating these catalogues periodically. An inspector or checker is attached to each GT. His (or her) role is to ensure that the passes proposed by the GT are in accordance with the Rules of the Game. Any borderline or disputed cases are submitted to the CoVal. The CoVal (Validation Committee) is made up of 5 members – 3 from the CA and 2 other members named by the CA in virtue of their experience and competence. This committee undertakes to study those passes proposed for which an agreement has not been reached in the GT (GT + inspector). After studying all the information and opinions it decides on whether to retain such passes or not and thereafter the CA can publish officially the catalogues. The publication of a new catalogue or an update automatically replaces previous catalogues. The role of regional or national animators is to organise regional gatherings with the aim of both facilitating friendly meetings between existing members as well as welcoming new members.